Sonya Schoenberger, ‘What Makes the Life’ / October 2-10.2010 / Artisterium ‘Imagine Future’, Tbilisi. სონია შონბერგერი, ‘What Makes the Life’ / ოქტომბერი 2-10.2010 / არტისტერიუმი “Imagine the Future’’ (წარმოიდგინე მომავალი), თბილისი. 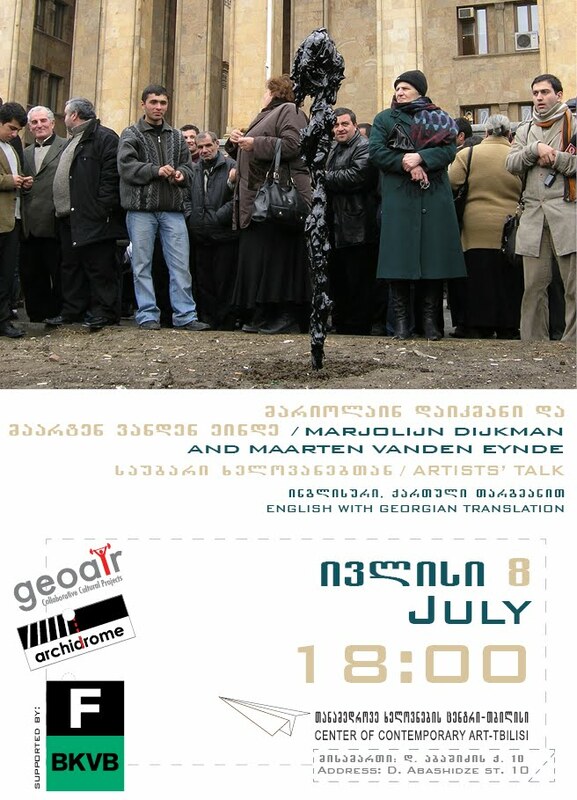 Work presentation / 26.03.10 / Goethe-Institut, Georgien, Sandukeli 16, 0108 Tbilisi. ნამუშევრების პრეზენტაცია / 26.03.10 / გოეთეს ინსტიტუტი, ზანდუკელის 16, 0108 თბილისი. სონია შიონბერგერი - გერმანელი ხელოვანი, მუშაობს ვიზუალური ხელოვნების სხვადასხვა დარგში: ვიდეო, პერფორმანსი, მხტვრობა და ქარგვა. იგი სწავლობდა სოციალურ ანტროპოლოგიას და ფილოსოფიას ბერლინსა და ციურიხში, ვიზუალურ ხელოვნებას ამსტერდამის რიტფელდის აკადემიაში და ექსპერიმენტულ ხელოვნებას ბერლინში. 26 მარტს, გოეთეს ინსტიტუტში, სონია შიონბერგერი წარადგენს ახალ პროექტს, რომელზეც იგი მუშაობდა თბილისში, გეოეარ-ის რეზიდენციაში ყოფნის დროს. გარდა ამისა, იგი ისაუბრებს ზოგადად თავის ხელოვნებაზე, რომელშიც იგი იყენებს ახალი ამბების ფოტო მასალას, რათა ხელოვნების მეშვეობით შეცვალოს ჩვენ ცხოვრებაში სულ უფრო და უფრო შემოჭრილი პრესის გამოსახულებები. ქარგვით, და ამის შედეგად აღქმული გამოსახულების კონტექსტის შეცვლით, იგი ცდილობს მისცეს მაყურებელს ხელმეორედ დაკვირვების საშუალება და გაზარდოს ზოგადად ჩვენ ყოველდღიურ ყოფაში მედიის გამოყენების შეგნება. სონია შიონბერგერის ვიდეო ნამუშევრებში ძირითადი თემაა მხატვრის გარემომცველი სამყაროს ყოველდღიურობის და ბანალურობის გააზრება და გამოყენება. პრეზენტაციის შემდეგ საშუალება გაქვთ შეუერთდეთ ხელოვანს კაფე-გალერეა პეროვზე (ახლვედიანის ქუჩა 15). Sonya Schönberger, German visual artist, working with video, photography, performance, drawing and stitching. 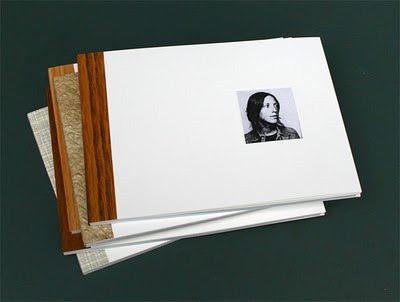 She Studied Social Anthropology and Philosophy in Berlin and Zürich, Visual Art at the Rietveld Academie Amsterdam, Experimental Mediadesign at the University of Arts Berlin. 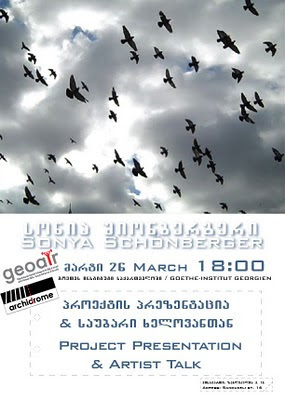 On March 26th, Sonya Schönberger will be presenting her new project, on which she worked during her residency at GeoAIR in Tbilisi. Besides she will be talking about her artistic work in general, for which she uses images sourced from news media to reverse the process of an emerging press image through handicrafts. By stitching and with this changing the context of the image that she perceives, she attempts to let the audience look again and enhance awareness of the use of media in general in our daily life. Another major topic in her work is using and reflecting on the everyday of her surroundings in her video works.